American Girl Brings Girls And Their Families Together For A Holiday Season Filled With Kindness And Generosity | Mattel Inc.
MIDDLETON, Wis., Nov. 9, 2015 /PRNewswire/ -- In an effort to bring more joy and friendship to thousands of girls and their families in need this holiday season, American Girl, a premium brand for girls and subsidiary of Mattel, Inc. (NASDAQ: MAT), is launching several new charitable programs as part of its "Together We Make the Holidays" giving campaign. Kicking off the season is American Girl's "Get a Friend. Give a Friend" campaign. From November 6 to 30, American Girl will match any 18-inch doll purchase made online, in-store, or via phone with a second doll donation (up to 1,000 dolls each day). Working with the Children's Hospital Association, the doll donation—worth nearly $3 million—will help bring comfort and cheer to thousands of young girls receiving care in any of the Association's 200 U.S. member hospitals in approximately 50 states. Additionally, with the help of generous, thoughtful girls across the country, American Girl is asking fans to continue to "bake a difference" through the company's For Goodness, Bake! initiative in support of No Kid Hungry®, a campaign of national anti-hunger organization Share Our Strength®. FromNovember 1 - December 31, American Girl will match dollar for dollar (up to $50,000) girls' holiday bake sale proceeds to No Kid Hungry. Originally launched on January 1 to celebrate the 2015 Girl of the Year Grace, For Goodness, Bake! has raised more than $450,000—the equivalent of 4.5 million meals for hungry kids! To further spread the joy of the holidays to even more girls, American Girl is contributing to TODAY's 22nd annual Holiday Toy Drive for the second consecutive year. On Monday, November 23, the brand will announce a donation of dolls and books worth half a million dollars to benefit thousands of young girls via the following TODAY show nonprofit partners: Boys and Girls Club of America, Kids in Distressed Situations, Kids in Need Foundation, andNational Head Start Association. American Girl has a long-standing commitment to helping children and families in need. The company is proud to support a wide range of causes to alleviate issues affecting millions of individuals, and works with leading charitable organizations to help make the world a brighter place. To learn more about American Girl's 2015 "Together We Make the Holidays" campaign, visit americangirl.com, or find us on Facebook facebook.com/americangirl, Pinterest http://www.pinterest.com/agofficial/, or Instagram http://instagram.com/americangirlbrand. American Girl is a premium brand for and about girls and a wholly-owned subsidiary of Mattel, Inc. (NASDAQ:MAT, www.mattel.com), the worldwide leader in the design, manufacture, and marketing of toys and family products. 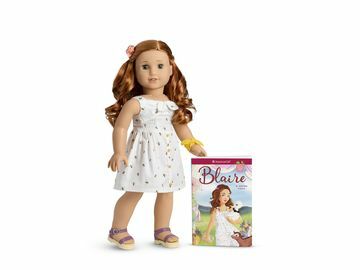 Headquartered in Middleton, WI, American Girl offers an inspiring world of dolls, experiences, and entertainment to empower and unite girls of all ages. Best-selling lines include Truly Me™, Girl of the Year™, Bitty Baby™, and the classic historical character line BeForever™. The company sells products through its award-winning catalogue, on www.americangirl.com, in its experiential retail stores nationwide, and in specialty boutiques at select Indigo™ and Chapters™ in Canada and El Palacio de Hierro locations in MexicoCity. 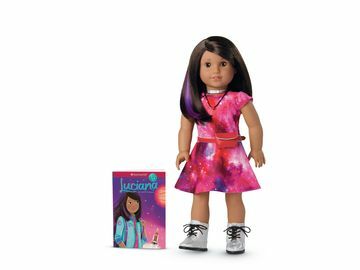 American Girl's mission is to fuel belonging and connection among girls, a goal that has already earned the loyalty of millions and the praise and trust of their parents and educators.